Hey everyone this is Danielle Hopkins with the The Rewind on AOL.com, where we give you a rundown of the top news and buzzy stories from the week. 1. President Obama urged Americans to remain vigilant against ISIS and the threat of homegrown terrorism during his year-end address, but didn't mention his plan to issue an executive order on gun control in the new year. 2. Bernie Sanders' campaign came under fire and was disciplined after the Democratic National Committee found his camp had improperly accessed Hillary Clinton's voter database. Sanders fired back with a lawsuit and claimed the DNC was trying to undermine his campaign. 3. Los Angeles shut down more than 1,000 public schools after receiving a bomb threat. City leaders were criticized for overreacting to what federal officials later said was likely a hoax. New York city officials also received a similar threat, but schools remained in session. 4. Army officials announced that Sgt. Bowe Bergdahl will go in front of the most serious ranking military court to face charges of desertion and misbehavior before the enemy. 5. During the final GOP presidential primary debate of 2015 on Tuesday, Jeb Bush and Donald Trump threw insults at each other during a heated confrontation over terrorism. 6. The mayor of a small city in Georgia killed himself following a domestic dispute with his wife. 7. A man and a woman who kidnapped and sexually abused two Amish girls in New York were sentenced to life in federal prison. 8. Martin Shkreli, the CEO of the company that caused public outrage after raising the price of a prescription drug by more than 5,000 percent, was arrested this week and charged with fraud for running his companies "like a ponzi scheme," as one official put it. 9. A new study revealed that developing cancer may have more to do with your lifestyle than your genetics. 10. Good news for Serena Williams -- this week she was named Sports Illustrated's Sportsperson of the Year, after having one of the most impressive years of her career. And here are three stories you won't want to have missed! Kim Kardashian revealed she's been taking a pill form of her own placenta everyday since she gave birth to her son Saint West earlier in the month. The reality TV star says it gives her "energy" and will help keep postpartum depression at bay. 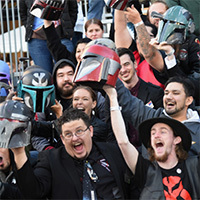 Walt Disney Pictures and Lucasfilm brought thousands of excited fans to the streets of Hollywood for the highly anticipated premiere of Star Wars: The Force Awakens. 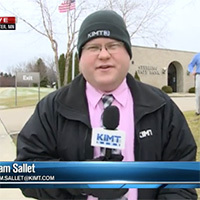 A bizarre bank robbery in Minnesota took the Internet by storm this week, when the thief ran past a live news report from the scene the day after the heist. And that's #TheRewind! To dive deeper into these stories click on the links in this article page. Check back with us at the beginning of the new year so you'll be in know for 2016!